myoldmac.net -SABA Game System Fairchild - Buy It ! The German version of the Fairchild Channel F in its original package.. Looks a little different than it's American, British, and Swedish counterparts. Has completely ditched the Answering machine and tape recorder look and goes for the late 70's stereo component thing instead. The console itself is tested and works and the build in games Tennis and Hockey start up, sharp screen - tested on a B/W display. The SABA Fairchild System is the world's first cartridge-based video game console. It was released by Fairchild Semiconductor (ostensibly by their parent company though) in August 1976 at a cost of $169.95. At this point it was known as the Video Entertainment System, or VES, but when Atari released their VCS the next year, Fairchild quickly re-named it. A number of licensed versions were released in Europe, including the Luxor Video Entertainment System in Sweden, Adman Grandstand in the UK, and the Saba Videoplay, Nordmende Teleplay and ITT Tele-Match Processor, from Germany. The console that changed home videogames as we know them, the Fairchild Video Entertainment System (VES) revolutionized an industry but soon suffered for it. By 1976, the Pong-driven videogame industry was starting to decline in popularity due to oversaturization, caused by "me too" companies flooding the market with cheap imitations. At this point, Fairchild entered the market with a new machine that wasn't a "me too" device at all. The Fairchild VES was designed at Fairchild Camera and Instrument Corporation, most known for their subsidiary Fairchild Semiconductor, whose chips the console was based around. Though little is currently known about the origins of the console, someone at Fairchild must have decided that the company should enter the new videogames market with a bang. Using one of their own microprocessors (still a very new concept in 1975), design of the console was centered around its being programmable. This was wildly different than the normal, still-evolving Pong systems, which were dedicated to only playing simple games with a multitude of variations at the flick of a switch. Fairchild's new console featured plug-in cartridges that contained ROM chips with actual microprocessor code, rather than dedicated circuits like those used in the plug-in cards of the original Odyssey game system. So instead of the short shelf-life common to Pong systems, Fairchild's console could now be continuously renewed by simply plugging in game cartridges, which they called "Videocarts." With the possiblity of new Videocarts released at any time, the potentially long lifetime of the console seemed very attractive to Fairchild. Big whoop you say? "You're just describing videogame cartridges." Aha, but remember ? this was 1976. This was THE first cartridge system, and it established a format that was to be used by almost every game company for years to come. Even today, when cartridges are finally being phased out in favor of CD-based consoles, they are still the de facto standard for handheld gaming systems, such as Nintendo's Game Boy series. 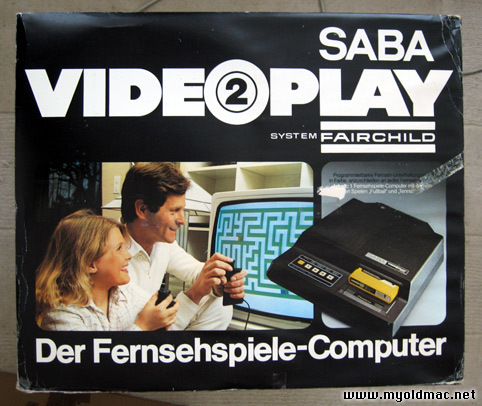 Ein SABA Fairchild Video Play 2 System in der original Verpackung. Die Konsole ist getestet, das interne Spiele Hockey und Tennis starten und der Screen ist scharf. 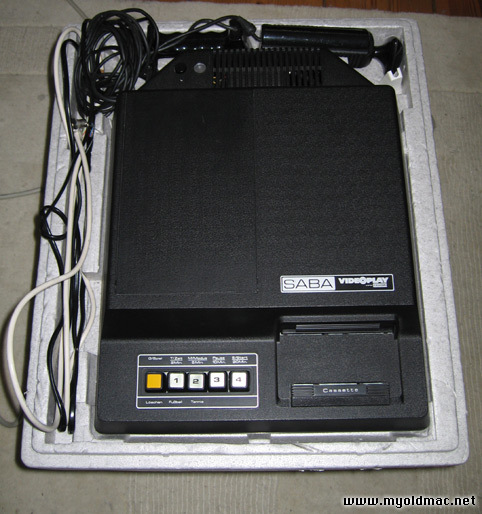 Die Videoplay-Konsole von Saba ist ein Clone des Fairchild Channel F, des ersten Telespiels mit austauschbaren Modulen. So revolutionär die Idee mit den austauschbaren Spielen bei Erscheinen der Konsole auch war (vorher gab es nur Konsolen mit eingebauter Software, meistens Pong), die Technik des Videoplay konnte mit dem kurze Zeit später auf den Markt gebrachten Atari VCS nicht mithalten. Die Spiele für Channel F/Videoplay sind grafisch nicht sehr aufwendig (vergleichbar mit sehr frühen VCS-Titeln, eher darunter) und vom Spielprinzip her meist simpel. Es macht aber teilweise trotzdem sehr viel Spaß damit zu spielen, besonders wegen der bemerkenswerten Steuerknüppel (die übrigens fest mit der Konsole verbunden sind). Es gibt von Saba zwei verschiedene Modelle, Videoplay und Videoplay 2. Beide unterscheiden sich allerdings nur marginal voneinander, die auffälligste Änderung sind die Steuerknüppel. Ansonsten sehen beide Konsolen gleich aus; es wurden auch schon Geräte gefunden, die außen als Videoplay und innen als Videoplay 2 beschriftet sind. Downloaden Sie das englische SABA Fairchild Channel F Manual - FAQ hier.